Today is the last day of a really wonderful vacation in Clearwater, Fla. I’m so happy to have had the time to spend with my 2 best friends Gail and Alice. But I have been very remiss in talking about someone who has been an invaluable help to me with BCDC during my stay. Ladies and Gentlemen, please meet Angel. She is Gail’s cat who is 12 years old, but she likes to say it’s a young 12 years. 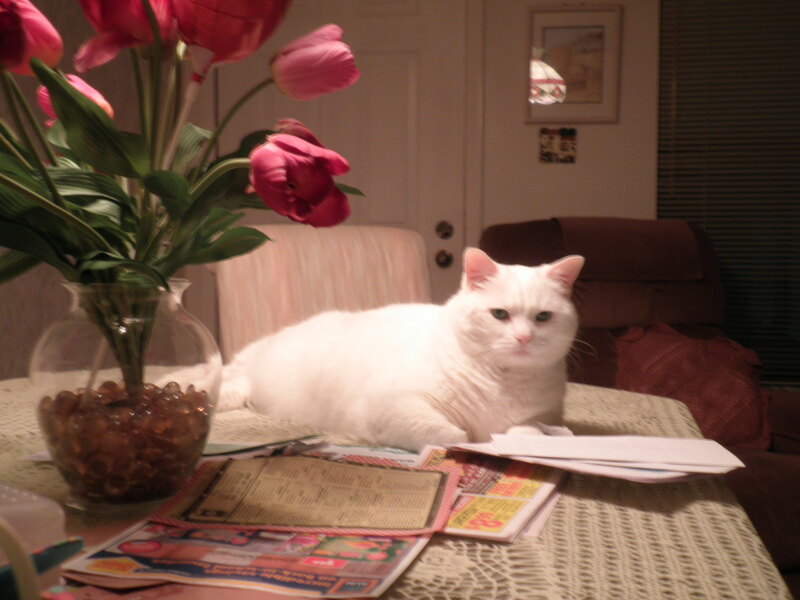 Everyday as I wrote my posts, Angel would be on duty at the end of the table helping me write. She says she is so smart because she eats so much fish and fish is brain food! She is very funny and vocal and she rules the world…just ask her! She does her best to be in charge and most of the time she is! Angel does let us go out and around for some fun. We got a later than usual start Wednesday morning because we had to go on-line to print my boarding pass for Thursday’s flight back to New Jersey. We left the house and were immediately looking for lunch. 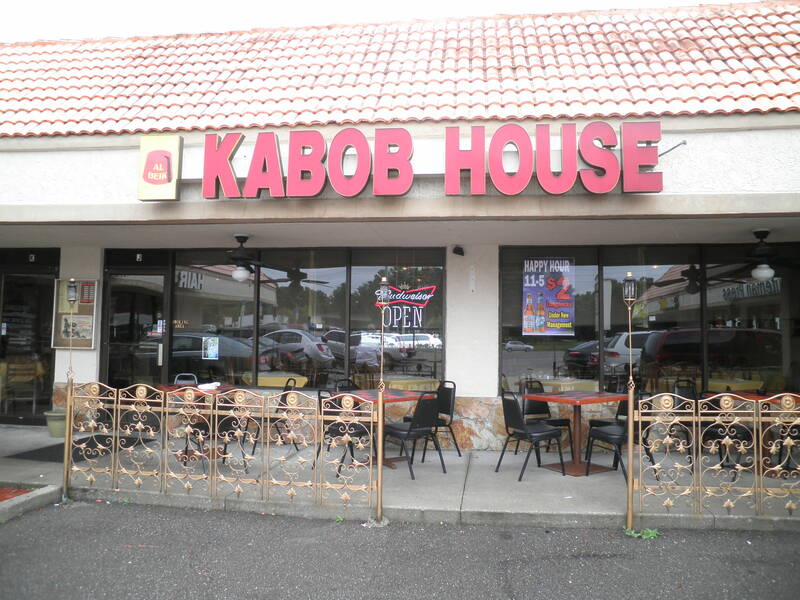 We had been kicking around the idea of going to the Kabob House in Dunedin. Every day we said we were going to go there and didn’t. We decided that today was the day. We had picked up a menu a few days ago and had a chance to look it over. I thought I’d be happy with it, but Gail and Alice weren’t sure which was why I didn’t push it as a choice. Gail and I both ordered the Falafel Pita Wrap. Alice got the chicken wrap. I always hear about falafel and I’ve never had it. This lunch proved to me that I like it! The portion was Huge for only $4.65!! Again, I didn’t eat the chips. Still proud of myself for sticking with that throughout vacation. I thought it was very tasty. The service was a little strange though. We had to ask for everything we needed. The waitress seemed like she might be new at this and didn’t think ahead regarding what the customers might want. But overall, I was pleased. I’d go back but I’m not sure if Gail or Alice would. After lunch, we went to Last Chance Thrift Store again, but I didn’t buy anything. 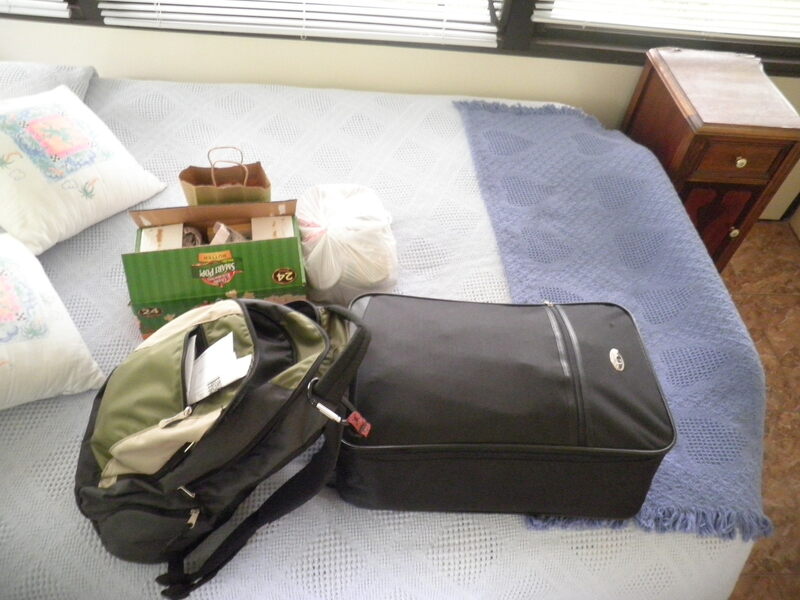 With flying out Thursday morning, I knew what I had as far as room to pack extras and basically there’s NO extra room. Got my bags packed and collected all of my treasures that will be traveling back to NJ by car with Gail at the end of the month. 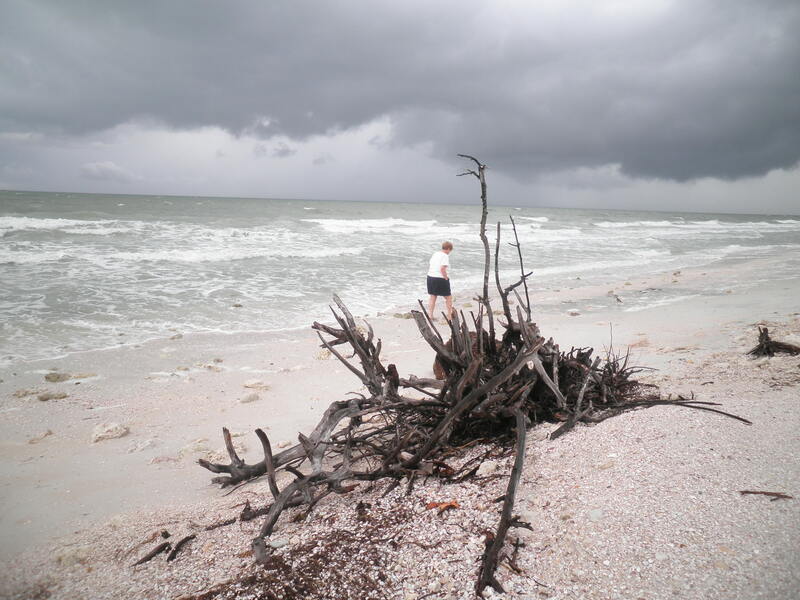 I’ll leave you with one more photo from our stormy day at Honeymoon Island. Thanks to Gail and Alice for a wonderful visit and to Angel for all of her help with BCDC!! I’ll be on my way to the airport by the time you read this on Thursday. I’m sorry to say goodbye to Florida, but I miss Ralph a great deal and I look forward to seeing him when I get to Philadelphia on Thursday afternoon. 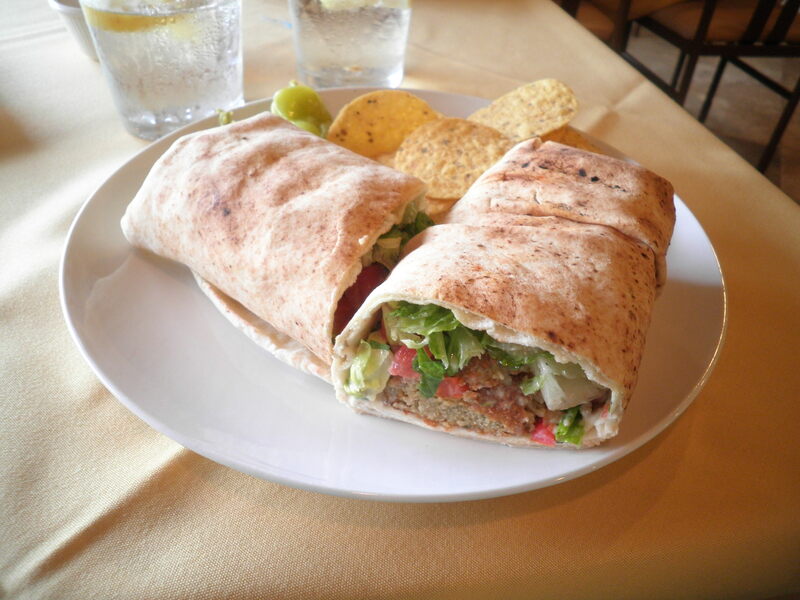 I love falafel…it hits the spot every time. Especially when it isn’t greasy! Safe travels my friend! I hope you and Ralph have a very happy reunion in Philadelphia! Hi Ameena! 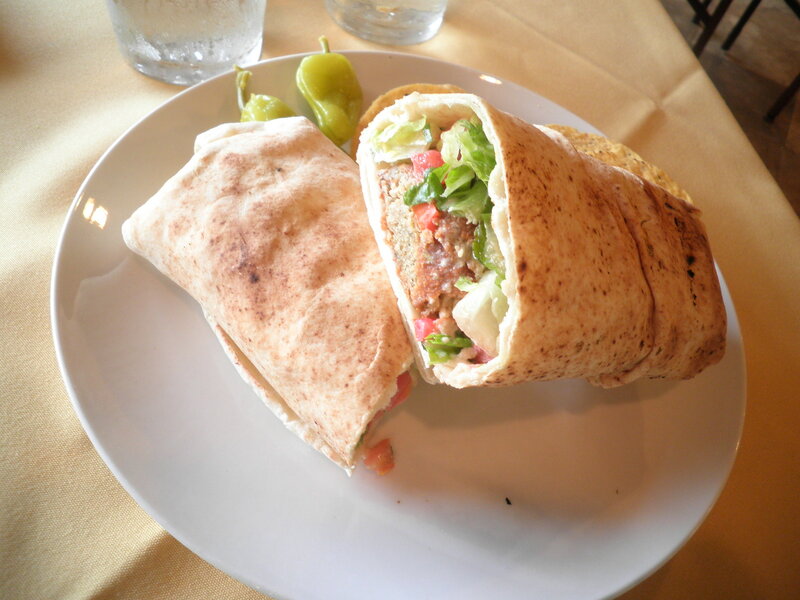 I loved the falafel and it was not greasy. I need to find a recipe to make my own. An adventure into a new culture! Ralph and I had a very lovely reunion except he went to the wrong terminal! Angel is a perfect name for such a pretty cat! Chase the Wonderdog would probably want to name her “giant furry squeaky toy”. Which is why we don’t let him name cats. Stephanie, that’s hysterical! 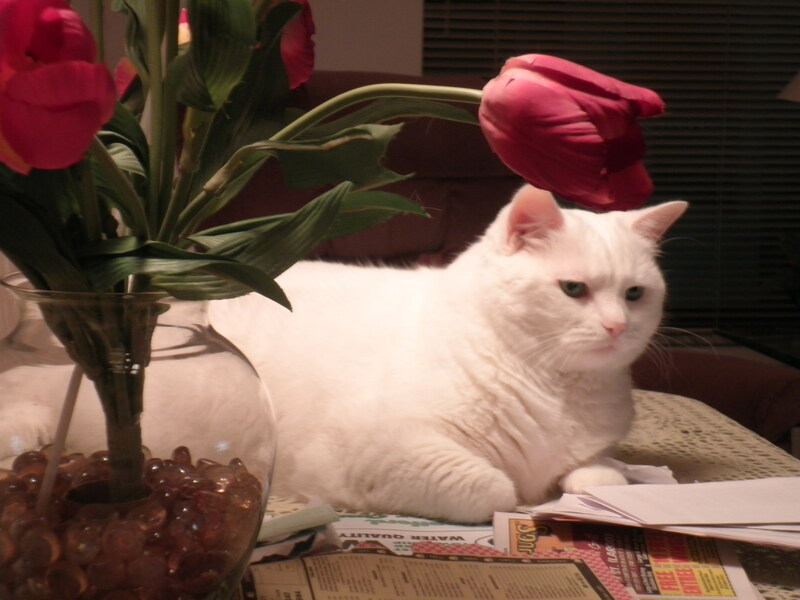 Angel is beautiful…she just likes to get up WAY too early. Gail has a lot of trouble sleeping which is why I would get up with Angel to keep her quiet. Then we’d sit and blog together. It was really cool! !